Friday evening and very busy with diners. Ringwood - Razorback 3.80 Not Tried This ran out. Loddon - Gravesend Shrimpers Bitter 4.10 A very dry bitter without much obvious hop or maltiness. Fairly quiet on a warm June evening, the opening day of the World Cup.We came to celebrate everyone being in the same place. Loddon - Gravesend Shrimpers Bitter 4.10 I'd often ignored this beer,but I found it a workmanlike bitter with a decent hop bill. 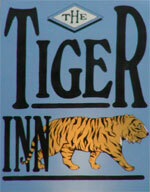 Old Dairy - Tiger Top 4.00 Getting towards the end of the cask:a splitting of flavour. The restorative effects of Jane Austen and good beer and food. Busy on a December Saturday lunchtime, intriguingly including a large party of babies. Pig & Porter - Ashburnham Pale Ale 3.80 A commanding spicy pale ale. Goody Ales - Bleangate Brewery - Good Life 3.90 A complex golden ale:candied blackcurrants. Not as cloying as my description might suggest. Good. For veterinary reasons we were starving the cat, so decided to get as far away as possible.Busy with drinkers and diners on a blustery November Saturday lunchtime.Enjoyed catching up with the Chairman. A cracking pub.Biddenden Bushells cider on handpump. Old Dairy - Tiger Top 4.00 An honest to goodness best bitter:amber, gratifying malt and underlying assertive hops.Touch of farmyard. Mid afternoon on a Saturday, and the customers were out in force, thankfully it was a nice sunny day and many people were sitting outside, leaving plenty of room for us non-smokers to enjoy the interior of this pub. Most of the customers were dining and the food looked very good, but we just had the beer. Came for lunch. Sat in the back. Yes, the food is now quite expensive but the surf and turf was excellent as was the nachos for starter and the desserts are pretty good. Hop Back - Summer Lightning 5.00 Yeah, pretty good, bit warm maybe, but the hops were good, they were decent pale malts and it was pretty drinkable. Somehow my boss persuaded me to take her out for a working lunch, so we came here. I still like this place, good lasagne and the feel of a village local. Which it is. Shepherd Neame - Early Bird 4.30 My first pint of this beer, this year. Got an almost white wine grape hop aroma. Slight yeast. Not a huge bite of hop on the finish. OK drinking bitter. Here for a colleague's maternity leave do. Quite full for a Tuesday. Food is excellent. Fuller's - London Pride 4.10 I could have drunk this all night, great quaffing bitter. A half of my pint would disappear in a single gulp. Tuesday lunchtime. Still a lovely pub to come to, especially at lunchtime from work. It feels like a real country pub in the middle of nowhere. Shepherd Neame - Master Brew Bitter 3.70 Copper/amber, lasting creamy beige head. Sheps yeast and some hop. Bit of toffee. Bit thin in mouth. Good bitterness in mouth and on end. Smooth in mouth but hop finish is good. Very bitter. The pub is found in Stowting, Kent, TN25 6BA. 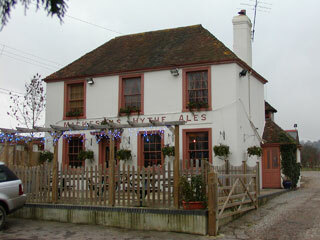 Excellent freehouse on the North Downs Way in a small village. 3-5 beers on with a couple from Shepherd Neame, London Pride and (although not latterly) an Everards house branded beer or Tiger. Food is also good and live jazz is played every Monday night. We have visited this pub 16 times, seen 25 different beers and tried 14 of them.